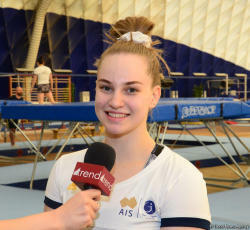 Kira Ward, a member of the Australian team of trampoline gymnasts, says she is glad to be in Baku and to take part in training in the additional hall of the National Gymnastics Arena. The training is being held well, she told Trend. Ward added that it is very convenient to train in the additional gymnastics hall in Baku. All members of the Australian team are pleased, she said. Ward said this is her first visit to Azerbaijan and she is glad to have the opportunity to come here and train in such a comfortable hall. 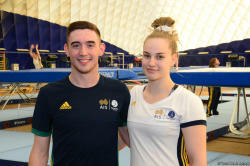 The Australian team of trampoline gymnasts arrived in the capital of Azerbaijan for training on the eve of the 33rd FIG Trampoline Gymnastics World Championships, to be held in St. Petersburg, Russia in November.